Foreword - from FIS President The 2018 edition of World Snow Day was a big success with over 500 events and actions, 11 city events and eight events in the southern hemisphere. Also impressive is the fact it was the 7th edition of World Snow Day, which shows continued enthusiasm to bring the next generation to snow sports. WE must constantly remember what the aim of World Snow Day is, to bring children to the snow. FIS has had over 100 years of experience in organsing competitive snow sports, but World Snow Day steps back and focuses on the grass roots of snow sports. The focus is on the everyday snow sports participants who take part for the sheer fun of it. World Snow Day also has a very important secondary goal that is important to communicate: safety. For this edition of World Snow Day we had the privilege of partnering with the MND Group to produce a series of safety animations. These animations are a tool that makes it easier for all snow sports stakeholders to educate youngsters on how to be safe on the mountain. The animations are free of charge and available in multiple languages. These animations are an excellent resource and I encourage all people in snow sports to incorporate this message into their programmes/communications. I would also like to take a moment to thank the partners of the 7th Edition of World Snow Day. The support of Eurosport, the European Broadcasting Union, Infront Sports & Media, SKADI, The World Federation of the Sporting Goods industry (WFSGI), The European Federation of the Sporting Goods Industry (FESI), Best of the Alps and the Preferred Suppliers has been valuable and FIS looks forward to continuing the cooperation with all. Looking ahead, I echo the words of last yearâ&#x20AC;&#x2122;s event and say that World Snow Day is on the right path. However I urge all persons involved not to stray from this path and remain focused on the primary goal which is to bring children to the snow. World Snow Day and Ice Mountain (BEL), perfect. Acknowledgements The FIS World Snow Day 2018 Final Report would not have been possible without the support of the Event Organisers and the contributions of hundreds of participants whose feedback has been invaluable. Thanks are also due to the FIS Member National Ski Associations and all partners and sponsors for their continued support. The 7th edition of World Snow Day took place on 21st January 2018 with more than 320â&#x20AC;&#x2122;000 participants exploring, enjoying and experiencing snow at 516 events in 46 countries. Event Organisers included ski and snowboard resorts, National Ski Associations, private event companies, ski and snowboard clubs, ski and snowboard schools, manufacturers and retailers. The 2018 edition of World Snow Day also the start of a new set of World Snow Day goals. The introduction of three new partners - MND Group, SKADI App. and Protect Our Winters - will advance significantly the goals of safety and environment conservation as well as bridge the gap between technology and snow sports. 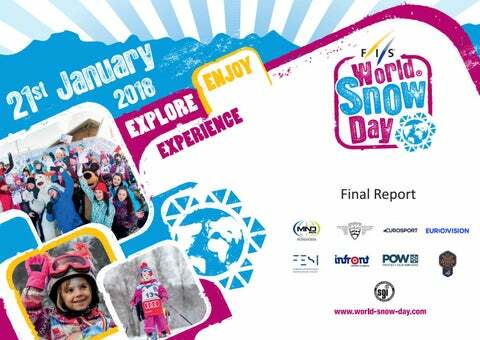 This report summarises the key facts and figures from the 7th edition of World Snow Day which took place on 21st January 2018. World Snow Day Goals and Analysis Primary Goals: Goal: Enable children and families to Explore, Enjoy and Experience the fascination of snow through special events and activities organised as part of World Snow Day. Measure: To average 500 events in 40 countries by 2020. Status: This years World Snow Day saw 516 events in 46 countries. The number of countries is above the goal as is the number of events. Goal: To ensure Organisers are satisfied with their events and efforts to bring children to the snow. Measure: To average an 87% retention rate of events by 2020. Status: According to survey results, 86% of Organisers will participate in World Snow Day 2019. This places this goal on track for completion. Secondary Goals: Goal: Increase awareness about the need to protect and conserve the natural environment. Measure: To have 50 events with environmental activities inside their event programme. Status: This World Snow Day saw 63 events utilizing the POW7. More information on the POW7 can be found here. Goal: Promote the health benefits of snow sports Measure: To establish a partnership with an external body who focus on physical health by 2020. Status: In preparation for World Snow Day 2018 discussions have opened on a partnership with two bodies to partner with the event. Goal: Emphasise the importance of snow safety and awareness of rules of conduct. Measure: To have had 50 events with safety activities inside their event programme. Status: 13 events implemented safety awareness into their programme. World Snow Day will increase this amount with the introduction of a new tool called the â&#x20AC;&#x153;SnowKidz Safety Animationsâ&#x20AC;?. The World Federation of the Sporting Goods Industry. 3’541 world Snow Day events over seven editions. More than 109’143 YouTube video views. More than 104’000 participants in the 7th Edition of World Snow Day! •	Over 15 million people reached on social media. World Snow Day by Continent and Country The 7th edition of World Snow Day saw 516 events in 46 countries. Types of Organisers The 7th Edition of World Snow Day saw an increased push from Ski/Snowboard Schools with a 6% increase on the previous edition. Like the last edition of the event, National Ski Associations lead the types of Organisers. Example Events Stockholm, Sweden: Full snow sports festival for kids with free lessons, demonstrations and product demos. Thunder Bay, Canada: Kids snow festival in the heart of the city. Himchal Pradesh, India: Kids snow celebration with free equipment and lessons. Throughout Austria: Free and discounted lift passes for primary school children Throughout China: 56 ski resorts with free skiing and snowboarding for children as well as live entertainment. Winterberg-Neuastenberg, Germany: Childrens snow festival with discounted lift passes. Throughout Poland: Free ski and snowboard lessons throughout the country. Huacachina Oasis, Peru: Skiing and snowboarding on sand dunes with free lessons. Tallin, Estonia: Free kids lessons. Throughout Lithuania: Kids snow day at primary schools throughout the country. Gudauri, Georgia: Kids snow festival with free lessons, lift passes, equipment and on snow entertainment. Rosa Khutor, Russia: Kids snow festival with free lessons, lift passes, equipment and on snow entertainment. Snowmass, USA: Kids environmental day. (18.10.2017) 100th World Snow Day event registered, Goderdzi Snow Day (GEO). This is 1 month ahead of the previous year. (15.12.2017) World Snow Day Trailer integrated into TV broadcasts of the FIS World Cups and released to networks worldwide. (21.01.2018) 7th Edition of World Snow Day celebrated with 516 events in 46 countries! (14.12.2017) 300 and 400th World Snow Day events registered. (15.12.2017) Registration closes (15.01.2017) 500th World Snow Day event registered, World Snow Day at Sunkar Ski Jumping Complex (KAZ). (16.01.2018) Reporting system for World Snow Day opens. (15.02.2018) Reporting system for World Snow Day closes. Social Media World Snow Day’s social media presence saw growth in 2017/2018. Organisers continued to embrace social media with the establishment of event pages, instgram accounts and after movies posted on their channels. The following statistics are taken only from the World Snow Day social media platforms. Kids, kids, kids. World Snow Day is about bringing a new generation to snow sports. This exactly what the Organisers did. The 7th Edition of World Snow Day was supported by nine exceptional partners: Best of the Alps, Eurosport, European Broadcasting Union, Federation of the European Sporting Goods Industry, Infront Sports and Media, MND Group, Protect Our Winters, SKADI App. and The World Federation of the Sporting Goods Industry. and Preferred Suppliers. The potential of World Snow Day has been substantially enhanced by these partners’ excellent participation and cooperation. MND Group Although confirming the partnership after World Snow Day 2018, MND Group will be a critical partner moving forward. Together with MND Group, World Snow Day will make teaching snow safety easier. This will be achieved through a series of animated videos that communicate the 10 FIS Rules for the Conduct of Skiers and Snowboarders in a fun but informative manner. The videos will be made available for free to all Organisers and can be easily implemented on various digital channels as well as onsite at events. The World Federation of the Sporting Goods Industry The World Federation of the Sporting Goods Industry (WFSGI) is an independent association with no objective of economic character for its own gain and formed by sports and sports-inspired leisure brands, manufacturers, suppliers, retailers, national/regional federations, industry and trade associations and all sporting goods industry related businesses. For the 7th edition of World Snow Day the WFSGI provided support in communications. From 22nd January to 20th February 2018, World Snow Day Organisers submitted event reports in the form of text, photos and videos through the World Snow Day Live Profile system. The individual 2018 World Snow Day event reports can be viewed here. During this period, an online survey was conducted to collect feedback anonymously from the public who attended a World Snow Day events and also those who could not. Feedback from Event Organisers Types of World Snow Day events From the data collected, the most popular promotion offered this year were free lifts passes (28%). Organisers who implement this action have reported this action yields the best results. Do you feel the World Snow Day brand helped you attract participants? 96% of Organisers said that the World Snow Day brand helped attract participants to some degree. Do you feel the World Snow Day brand helped attract media attention? 44% or 230 Organisers stated the World Snow Day brand was â&#x20AC;&#x2DC;very helpfulâ&#x20AC;&#x2122; in attracting media attention. Do you feel the World Snow Day brand helped attract sponsors and partners? 80% of Organisers said World Snow Day helped them attract sponsors and partners. Do you feel the World Snow Day brand helped motivate your team? 57% of World Snow Day Organisers said the World Snow Day brand was very helpful in motivating their team. Do you plan to Organise an event for the next edition of World Snow Day (20th January 2019)? 87% of Organisers have indicated they will stage a World Snow Day event in 2019. Feedback from World Snow Day Participants How much did you enjoy your World Snow Day event? 96% of respondents reported that they enjoyed World Snow Day events. This is an increase of 22% on last year. How did you hear about World Snow Day? Local event Organisers over took social media as the number one source for events. This is a good sign as shows the connection between Organiser and participant getting closer. What interests you about World Snow Day? ‘Activities on snow’ reclaims the top spot from ‘Gathering with friends and family’ as the primary interest for World Snow Day participants. Which special offers attracted you to the events? Promotions on lift passes along with ‘prizes and giveaways’ are the top special offers appreciated by World Snow Day participants. Do you plan to participate in the next edition of World Snow Day (20th January 2019)? According to participants, 89% said they would attend next years World Snow Day events. Feedback from Non-Participants How did you hear about World Snow Day? For the 3rd year in a row, social media was the number one platform non-participants heard about World Snow Day. Why could you not participate in the 6th Edition of World Snow Day? Hearing about events too late continues to be the main reason people could not attend World Snow Day celebrations. This is actually a favorable result as it is a problem that can be easily overcome. Which activities or promotions would help you to participate in snow sports more? Promotions on lessons continued to be the special offer of most interest for nonparticipants. Do you think you might participate in the next edition of World Snow Day (20th January 2019)? 85% of non-participants said they would attend World Snow Day in 2019. This is an increase of 4% on the previous year. Suggestions from the public In addition to answering multiple choice questions those surveyed also had a chance to provide open feedback. Below are some of the responses from the over 1200 respondents. Based on information and feedback, FIS has compiled a list of suggestions for future World Snow Day Organisers. Early registration Every year World Snow Day registration opens on 1st July. It is recommend Organisers take advantage of this and register early. This will begin early communications of events so the public can plan ahead. Moreover early registration will place Organisers in pole position to take advantage of offers such as the Organiser Care Packages. Hint: All Organisers must submit a new registration each year. The 7th edition of World Snow Day has seen the event return to form with over 500 events. 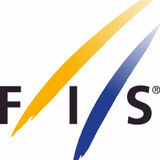 This is a great sign given FISâ&#x20AC;&#x2122;s overall goal of stabilizing the progamme and bringing in more consistency. As well as coming back into form, World Snow Day has been lucky enough to bring in three new partners; MND Group, SKADI App. and Protect Our Winters. Thanks to MND communicating how to be safe on the mountain will become easier. Protect Our Winters will help World Snow Day and its events advance its goals of environmental conservation. Finally SKADI App. will help all snow sports person have an easier day on the snow with guides and tips all on your smart phone. World Snow Day is continuing to evolve and grow. The project has achieved a lot but the best is yet to come. See you for the 8th Edition of World Snow Day on 20th January 2019!